The protected harbor and sandbar that had kept the British from entering bay also prevented Perry's two largest ships from leaving. A mere four feet of water lay over the sandbar that separated the bay from the lake. The Lawrence and Niagara, requiring at least nine feet to cross safely, were trapped—leaving the squadron vulnerable to the patrolling British ships. Luckily, Noah Brown, a New York shipbuilder overseeing construction, had foreseen the predicament months early and had constructed rectangular barges called "camels" that could be used to raise the ships over the sandbar. The Lawrence and Niagara—each stocked with supplies, materials, and heavy cannons—had to be completely unloaded before the camels could be used. Every man available was commanded to help. Perry's men toiled for three days to haul the two brigs over the bar and into the lake, at which point the ships were restocked. With the Niagara caught atop the sandbar and the Lawrence still stripped of its guns, British sails reappeared on the horizon. You can imagine the terror that the American crew must have felt when they saw the British. Perry decided to bluff and ordered two smaller gunboats to sail directly toward the British squadron. The enemy ships, under the command of Commodore Robert Heriot Barclay, retreated! In another miraculous turn of events, the British wrongly assumed that Perry's entire fleet lay poised to attack. 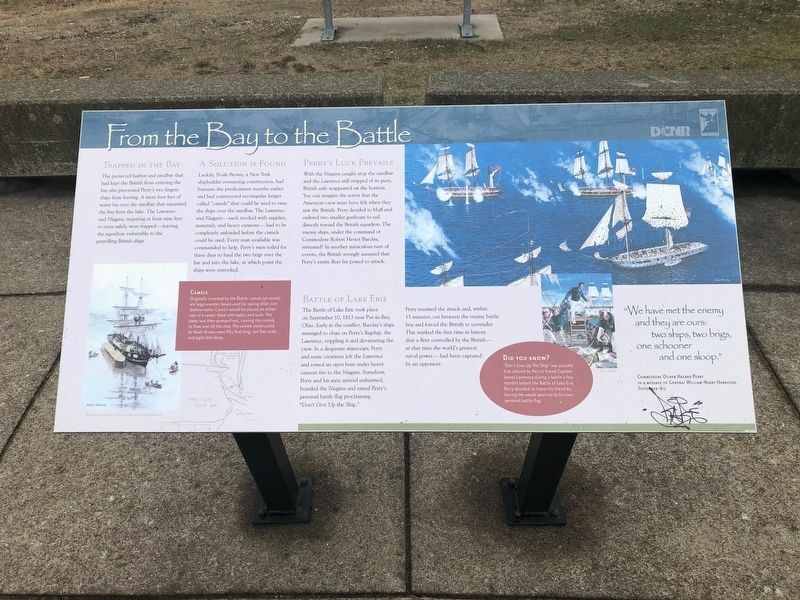 The Battle of Lake Erie took place on September 10, 1813 near Put-in-Bay, Ohio. Early in the conflict, Barclay's ships managed to close on Perry's flagship, the Lawrence, crippling it and devastating the crew. In a desperate maneuver, Perry and some crewmen left the Lawrence and rowed an open boat under heavy cannon fire to the Niagara. Somehow Perry and his men arrived unharmed, boarded the Niagara and raised Perry's personal battle flag proclaiming "Don't Give Up the Ship." Perry resumed the attack and, within 15 mintes, cut between the enemy battle line and forced the British to surrender. This marked the first time in history that a fleet controlled by the British—at that time the world's greatest naval power—had been captured by an opponent. Originally invented by the Dutch, camels (or scows) are large wooden boxes used for raising ships over shallow water. Camels would be placed on either side of a vessel, filled with water, and sunk. The water was then pumped out, causing the camels to float and lift the ship. The camels constructed by Noah Brown were fifty feet long, ten feet wide, and eight feet deep. "Don't Give Up The Ship" was actually first uttered by Perry's friend Captain James Lawrence during a battle a few months before the Battle of Lake Erie. Perry decided to honor his friend by having the words sewn on his own personal battle flag. Erected by Pennsylvania Department of Conservation & Natural Resources. Location. 42° 9.294′ N, 80° 5.359′ W. Marker is in Erie, Pennsylvania, in Erie County. Marker can be reached from Thompson Drive north of Fisher Drive, on the right when traveling north. Touch for map. Marker is in this post office area: Erie PA 16507, United States of America. Touch for directions. Other nearby markers. At least 8 other markers are within walking distance of this marker. Commodore Oliver Hazard Perry Monument (a few steps from this marker); Perry Monument: A Beacon of the Community (within shouting distance of this marker); Erie's Industrial Explosion (within shouting distance of this marker); Son of the Sea (within shouting distance of this marker); Tribute to a Hero (within shouting distance of this marker); And the Misery begins... (within shouting distance of this marker); Fishing on the Sweet Sea (within shouting distance of this marker); Preparing For Battle (about 400 feet away, measured in a direct line). Touch for a list and map of all markers in Erie. More. Search the internet for From the Bay to the Battle. Credits. This page was last revised on April 16, 2019. This page originally submitted on April 16, 2019, by Devry Becker Jones of Washington, District of Columbia. This page has been viewed 24 times since then. Photo 1. submitted on April 16, 2019, by Devry Becker Jones of Washington, District of Columbia.